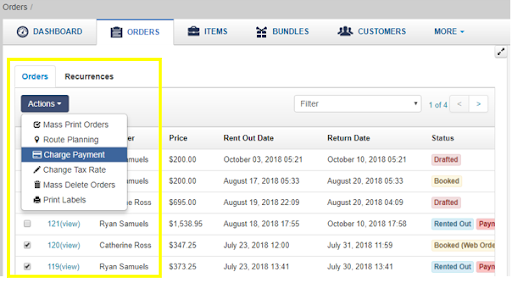 The order experience in EZRentOut is specifically designed keeping the Point of Sale in mind. This includes quick editing of orders, constant feedback as to what’s available, barcode scanner integration and credit card swipe. 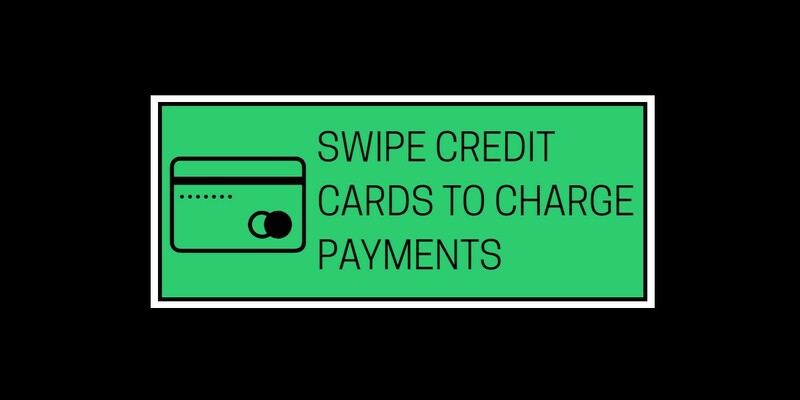 The Credit Card Swipe is available with Stripe, Square, Moneris, Braintree, Paypal, and Authorize.net. 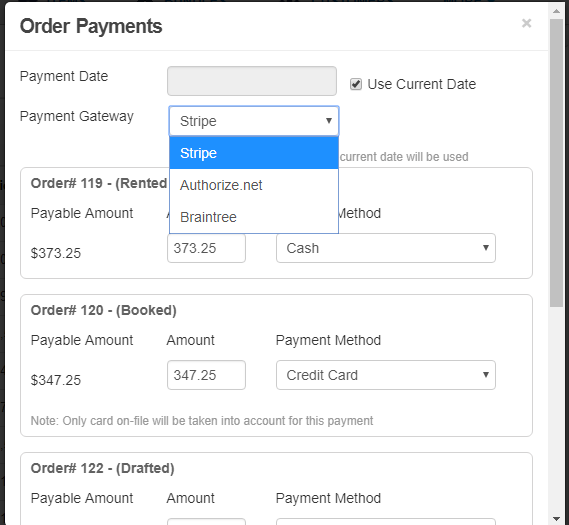 Integrate your Stripe account from Your name at top right -> Settings -> Add Ons -> Credit Card Payments with Stripe -> Enable. 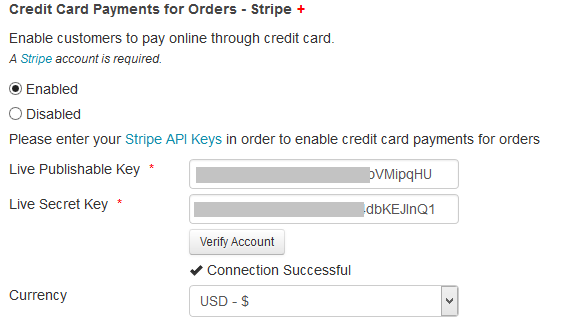 Once you click Enable, you’ll need to enter the Publishable and Secret keys of your Stripe account. These are available on your Stripe account here. You may need to change the currency from the drop-down. Steps to integrate with Authorize.net are (almost) similar. Click here to view the step-by-step guide. NOTE: The downside of an in-store credit card charge without using an EMV reader is the merchant’s liability exposure i.e. you having to pay for fraud. So if you’re anticipating such issues, this option is not for you. (UPDATED 1st June 2017) For EMV credit card reader (and contactless charging), we’re about to release an Android-only enhancement for Stripe integration, let us know if you’re interested in signing up for the early access. The iOS/iPhone integration will happen later in the year. On order details, with every customer, you’ll see the Credit Card icon. It’s red when there is no card in the record. This is the form that pops open when the red Credit Card icon is clicked. All you need to do on this pop up is swipe the card, and we catch all the details. 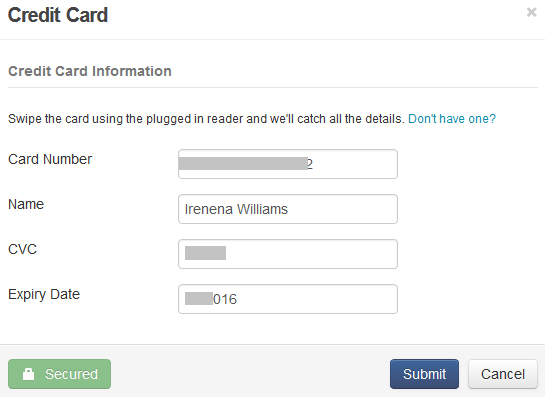 You can also choose to use a different card and update the card on file for this customer. 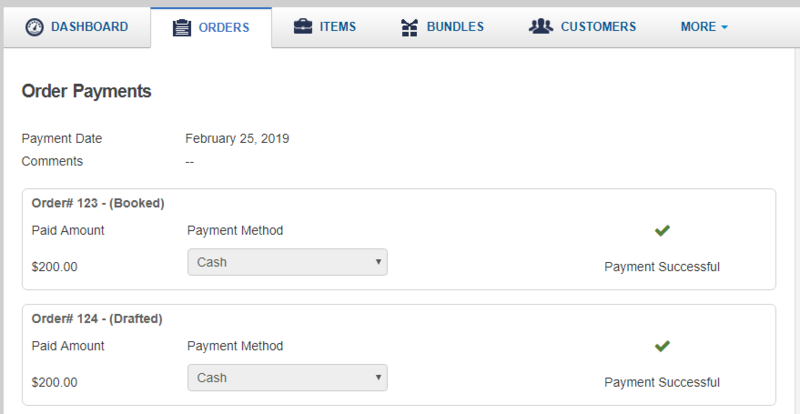 However, you should know a couple of tips before you start charging a payment for multiple orders. Pre-Authorizing a payment is also supported. Say, you want to hold an advance payment of $275 and when the payment date arrives, deduct the entire rental price e.g. $429, including the pre-authorized amount. 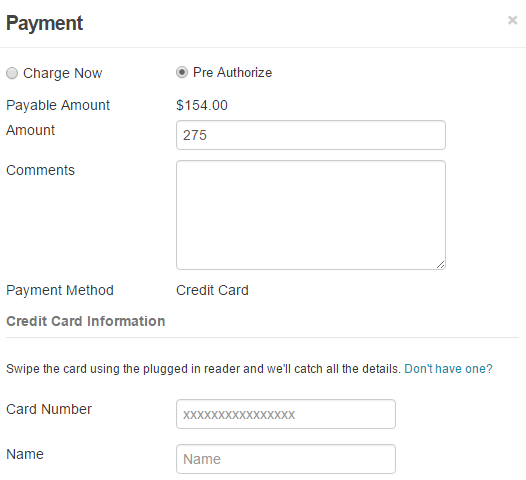 You just need to choose ‘Pre-Authorize’ when charging payment. You can then charge or cancel the hold. Add Order -> Add your new customer from the pop-up that appears -> On the order page, hit the Red Credit Card button to swipe a card. This entry was posted in [Support], Integration and tagged authorize.net, Point of Sale, stripe by admin. Bookmark the permalink.